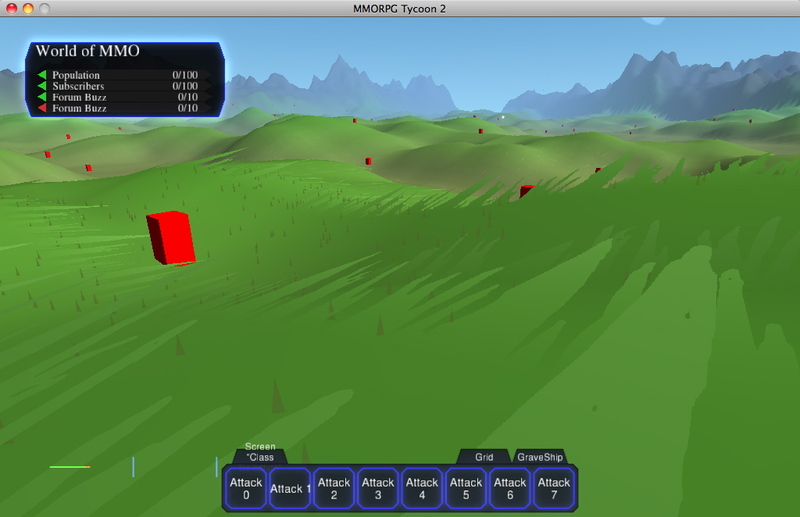 Folks might remember in the 1.0 version of MMORPG Tycoon, there was a limit of 100 players per zone; if the zone filled up, any new players who attempted to enter the zone would be knocked offline, and the server could crash (unlikely; from memory, it was about a 1% chance of a server crash each time a player was knocked offline). In the 1.1 version of MMORPG Tycoon, that limit was raised to 300 per zone, but the monsters in the zone were counted toward that limit. Still, in most zones you’d have around 70-80 monsters, so you could still have far more players in one zone than before. The first thing I need to mention is that the regions in version 2.0 are approximately the same size as the ones in 1.0 and 1.1; they’re still about a kilometer across. However, since we’re able to actually zoom in and stand on the ground, these 2.0 regions look a lot bigger than the regions from the previous revisions which were only visible in a top-down view, and so some things which seemed okay in the previous versions seem wrong, here. This screenshot is the first example. The spacing of monsters looks pretty sparse, doesn’t it? If you took this much space from a real MMORPG, there’d be a lot more monsters than you can see here. 80 monsters spread evenly in a v1.1 zone this same size looks about right for the space there, but in v2.0.. well.. suddenly it looks empty. And there weren’t just 80 monsters in the region I was standing in for this screenshot; there were 651 of them, approximately evenly spaced. And even with more than eight times the number of monsters in the region, it still looks empty compared to v1.1. Why did it look right in v1.1? I’ve gone back to check. Part of it was that the monsters (and the players, for that matter) were drawn huge. 20-30 meters tall, generally. Having the graphics for the characters larger than life made them easier to see when zoomed out, and helped make the regions feel “full”, even when they actually were even sparser than v2.0 appears to be in this screenshot. It embarrasses me that I didn’t notice how huge I’d made the characters in v1.1, when I was coding that. So what do I do to fix this for v2.0? Well, I’m thinking that I’ll probably make the regions a little smaller, to begin with. That’ll mean I’ll be able to make them feel “full” without having quite so many monsters in each.. though it’ll probably still be around 600-800 monsters per region. Making the regions smaller will also make it less frequent to be unable to see the mountainous border at the far end of the region you’re in, if you happen to have a clear view that far. I might also intentionally make monsters and players a little bit larger than they are now. Not to the silly extent from 1.1, but it might be reasonable to make the players, say, 2.5 meters tall by 1.5 wide, instead of 1.5 by 1.0. But it’s kind of neat to find this sort of fault in old projects; discover that I’d overlooked something like the scale of the character graphics, which caused all sorts of other little bits of bizarreness in the project. Years from now, I wonder what I’ll see when I look back on v2.0. 20 February, 2010 in Full Games, MMORPG Tycoon.